SO- There was switch up a few years back when New York being the bold rebel it is, decidedly (and without asking) switched its spot in the pecking order of catwalk season. In the past, New York comfortably sauntered in after London, Milan and Paris - but "The Rebel Without a Cause" (New York) had a cause for change. The cause was making a statement and solidifying New York fashion week's individuality from its European peers. The idea being that New York wasn't being "inspired" by Paris, London or Milan, but rather innovative in owning itself. Being a fashion loving loyal New Yorker, I can honestly say that this was an exciting move. Why shouldn't New York be different? Why shouldn't we lead the pack? After all we are a city inspired by constant change and constant the pursuit of standing out. Here is a look at what we are looking forward to come February 6th !!! 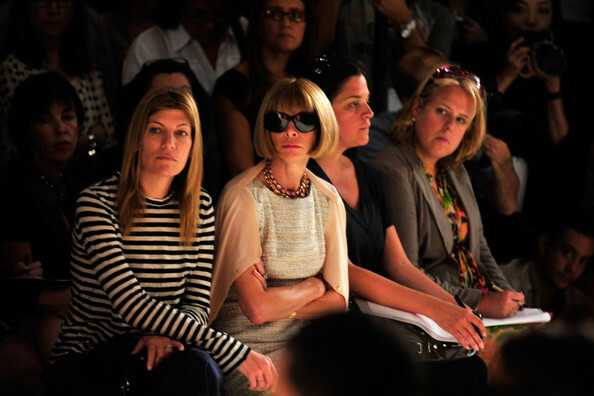 1.WHO WILL SIT NEXT TO ANNA WINTOUR? Whoever is sitting next to Anna Wintour definitely, without a doubt, has the best seat in the house! What's photographed on the runway is now just as important as what's photographed behind the runway curtain with social media. We can't wait to see all of the models in rollers pics to come! Which celebrities will attend which shows? Who will mingle with who? Most importantly, what will they be wearing!? For all of us whose invitations got lost in the mail, we can at least pretend we're regular NYFW attendees by taking style inspiration from all the editors and bloggers in attendance and applying it to our own wardrobe. You won't have a problem figuring out what to wear in the morning ever again. Subscribe to receive 15% OFF your first purchase with us! Copyright © 2019 L'Etoile. All Rights Reserved.